Labuan War Cemetery, Plot H, Row D, Grave 15, Age 38. Fukuoka sub-Camp No. 1. Soldier's ashes are believed to have been carried from Japan to Labuan by an unknown serviceman. Soldier’s ashes are believed to have been carried from Japan to Labuan by an unknown serviceman. Bill was selected with ‘Aramis’ party to work in Japan. There were 19 men from 2/4th in this party. Read further about ‘Aramis’ Party. 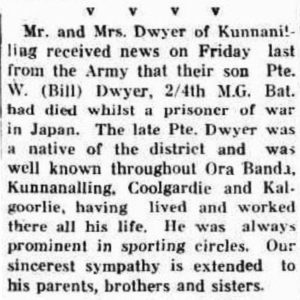 Prior to his enlistment, Pte Dwyer was residing at Kunnanalling. Bill Dwyer’s parents John Westby Dwyer and Georgina Alexandra Rutherford were born in Ballarat and moved to WA in early 1900s. Known as Westby, Dwyer’s business interests were in gold mining. Bill was the second youngest of five children of whom 3 were boys. Bill’s mother died at Kalgoorlie in April 1946 and his father died in 1955. Both are buried at Kalgoorlie Cemetery. He enlisted 24 September 1941 and sailed with 2/4th on ‘Aquitania’ 16 January 1942 as a reinforcement. He was selected with ‘D’ Force V Battalion to work on Burma-Thai Railway in 1943. V Battalion suffered a high number of deaths. He was able to survive and was selected from Non Pladuk to work in Japan. Bill was extremely unlucky to become ill and die in May 1945, only a few months before end of the war. 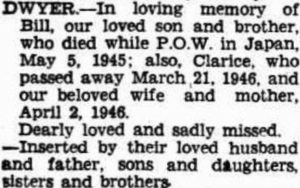 Above notice was following the death of Bill’s mother and sister in 1946.